How Do Section 508 Updates Relate To Translation And Localization? You may not have thought of it, but if you are localizing or translating your website and digital content, you may need to keep it Section 508 compliant. With over 20% of web users that have some disability, Section 508 compliance can help you reach up to 20% more of your target audience that you otherwise may miss. Since June 2001, all digital content produced with federal money has been required to be Section 508 compliant, including all content hosted on third-party services/sites. This applies to all digital content file types, including Word, .pdf, PowerPoint, Audio, Video, Multimedia, etc. By the end of 2013 or early 2014, requirements for Section 508 compliance will be updated. This will potentially impact all government agencies, with the idea that through market pressure, all web content will become more accessible. Updates include increased oversight, metrics, resources, collaborating and reporting requirements along with best practices. Keep reading to learn how Section 508 updates relate to your translation and localization projects. Section 508 of the Rehabilitation Act of 1973 requires all federal agencies to produce, procure and maintain accessible electronic information. Section 508 helps provide people with disabilities by making accessible web/digital content they can use. Section 508 applies to web applications, web pages and all attached files. This content can be on mobile devices, in digital documents or on websites. Section 508 compliance requires that all non-text elements have a text equivalent, that content be able to be navigated without a mouse and that there be plain language and clear design for those with cognitive impairments. For example all graphics, multimedia, audio, etc. must also have text equivalents using “alt” tags, “longdesc” tags, in element content, transcripts, etc. Click here for a more in-depth look at Section 508 and compliance criteria. Why Is Section 508 Compliance Important? More than 20% of the web audience has some disability and may require assistive technology. Updating digital content to meet Section 508 compliance can help your organization reach the elderly and people with disabilities (including vision, hearing, motor and cognitive impairments). On average, 13.2 million people in the US have at least one disability that Section 508 is meant assist. Compliance with Section 508 can help you reach up to 20% more of your target audience, that you otherwise may be missing. As if that carrot weren’t incentive enough, on March 21, 2013 a Wall Street Journal article reported that the number of lawsuits by disabled Americans looking for accessibility to digital content have gone up. Lack of compliance can have some expensive repercussions if you end up losing a lawsuit for failing to make your digital content accessible. How Does Section 508 Affect Translated And Localized Digital Content? 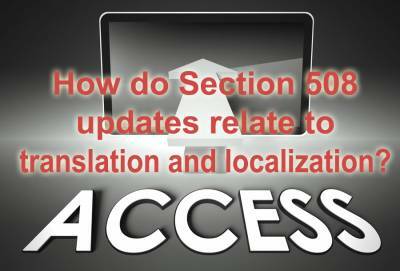 Section 508 guidelines relate to translation because all websites that are localized must remain accessible. It stands to reason that some of the disabled population may also have limited English proficiency (LEP) and thus require both localization and accessibility. This means when translating or localizing your digital content or websites it is important to pay specific attention to translating all alt tags and metadata so that digital readers will be able to decipher this content for disabled users. For example, on any website there may be images, graphics, audio and/or multimedia. To be Section 508 compliant, graphics should contain alt tag descriptions to describe the graphics for visually impaired audiences. Translations and localizations, to remain compliant, must also translate these alt tags into target languages so that readers will still be able to decipher the content. Section 508 requires audio to have corresponding transcripts and multimedia to have subtitles when appropriate, both of which should also be translated and localized to maintain compliance. It is important to note that as an added and unintended benefit, making your digital content accessible by using alt tags and text also positively impacts SEO and search engine rankings while also making your content perform better on devices of all sizes. Complying with Section 508 while localizing your digital content may be necessary, but it also helps you reach 20% more of your target audience and can give your SEO and search rankings a boost. How have you made your localized content Section 508 compliant, and what questions do you have about Section 508? Please let us know in our comments section. Also, if you learned something here, please like and share this blog socially using the buttons above. This blog is dedicated to helping you understand and translate all things related to language services. We discuss translation and localization topics related to the scientific, medical and technical industries. We welcome your comments, questions, tips and strategies.